LAHORE: Around 100 activists belonging to various human rights’ groups along with friends and family of Raza Mahmood Khan on Saturday set up a protest camp outside the Lahore Press Club to demand the earliest recovery of the abducted activist as well as all other missing persons across the country. Raza Khan, a convener of Aghaz-i-Dosti, a friendship initiative between the youth of Pakistan and India, went missing from his residence in Naseerabad on December 2 and since then his whereabouts are unknown. 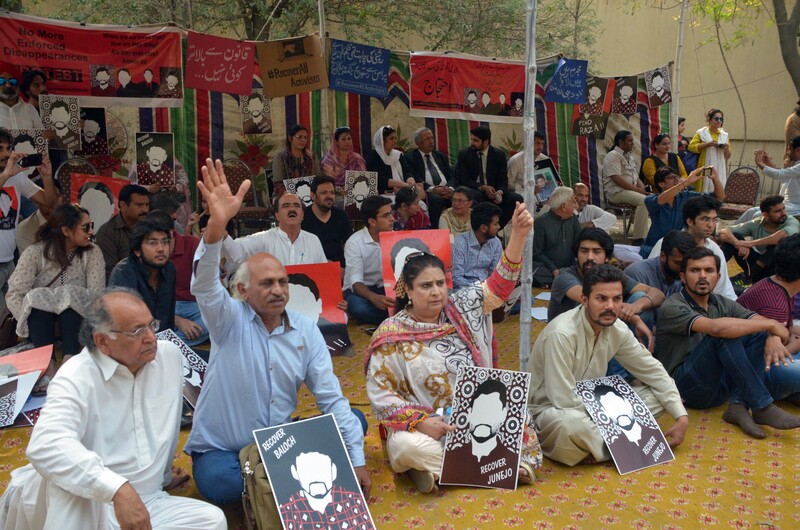 A large number of human rights activists participated in the protest camp that was set up for four hours (1 pm to 5 pm) and condemned the “enforced disappearances” of activists and attempts to “silence and harass those speaking up for peace”. Banners inscribed with slogans like “Down with illegal abductions”, “I am next”, “#FindRaza”, “where is the judiciary; where is the democracy”, “enforced disappearance is illegal”, and “recover all activists” were also installed at the site of the protest. Hussain Naqi of the Human Rights Commission of Pakistan (HRCP), renowned human right activist I A Rehman, renowned Supreme Court lawyer Raja Zulqarnain, peace activist Diep Saeeda of the Institute for Peace and Secular Studies, and lawyer and Director of the Digital Rights Foundation (DRF) Nighat Dad addressed the participants of the protest while Pashtun Tahafuz Movement (PTM) leader Manzoor Pashteen and human rights activist from Sindh Mir Talpur addressed the camp via telephone. The speakers condemned the enforced disappearances and appealed to the government to recover Raza and all others. They said the trend of abducting activists had created a sense of fear in the country and alleged that it was aimed at silencing them. The protesters vowed that they would not remain silent and would raise the issue at every forum till the recovery of the last missing person as Articles 4, 10, 24 and 25 of the Constitution protected the rights of citizens and activists. They also urged Chief Justice of Pakistan Justice Saqib Nisar to take a suo motu notice of the disappearances. Talking to Pakistan Today, Muhammad Ismael, Raza Khan’s father said that his entire family was in a state of shock since the abduction. “If Raza has done something wrong, he should be produced and presented before the court of law. At least the family should be informed about his whereabouts so that we know our son is alive,” he said. “I have knocked the door of every forum for justice but to no avail,” said Raza’s father and demanded an immediate release of all other missing persons as well. It may be noted that according to the Commission of Inquiry on Enforced Disappearances, as many as 116 cases of disappearances were registered in February 2018 alone. International rights organisations including the Amnesty International are also demanding from the Pakistani government to ensure the earliest recovery of all missing activists including Raza Khan.